our minds. our thoughts. our prayers. our hands. our spirits. our pockets. our donations. flow by flow. let’s flow for flo. We do too! Are you into trade? How about we do this? You donate whatever spare change you have + we’ll provide you with free yoga! We know a lot of people are suffering in our Rabbit Hole (or our hometown of Wilmington, NC) due to Hurricane Florence. If that’s you, register for a class on us! No need to donate. If you feel lucky enough to have been spared + would like to donate $5, $15, $150, $1500 for a class, we welcome you to pay what you can for one or more of our many yoga classes provided by yoga teachers around the US who are donating their time out of the goodness of their hearts. 100% of the donations we receive will go directly back into the community. If you know of anyone who has received significant loss due to Hurricane Florence, please ask them (or help them) fill out our donation application below. Because it’s important for us to make a direct impact person-to-person, we are not going through a nonprofit. No matter where you are in the world, you have an opportunity to make a difference in the community of Wilmington, NC. 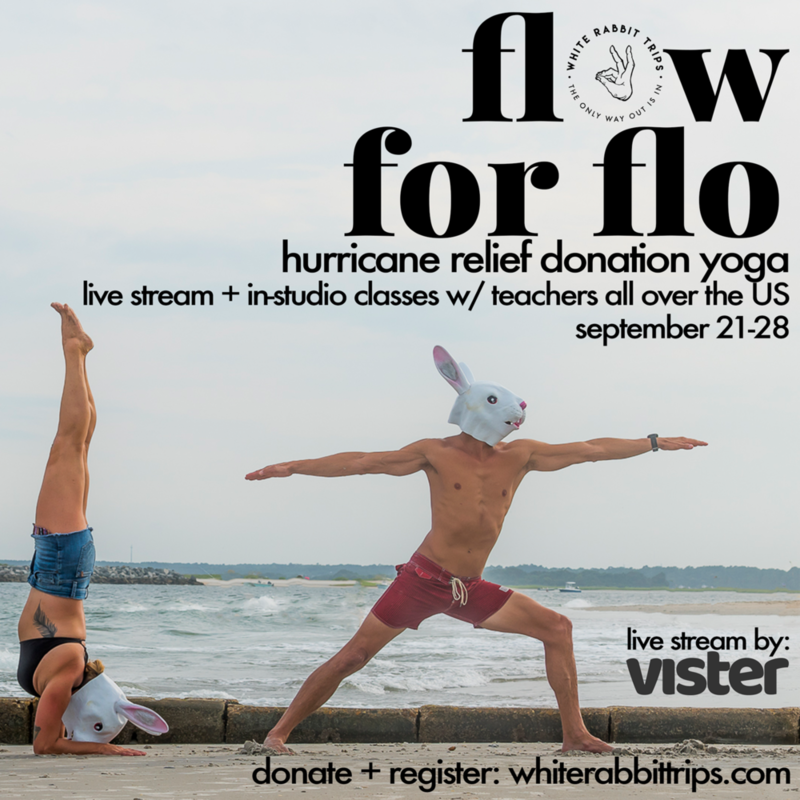 By joining us for a donation-based yoga or meditation class through a live stream provided by our friends at Vister, or in person at one of our dedicated yoga studios or business affiliates, you are helping those who were affected by Hurricane Florence. Want to join us? Simply make your donation through our gofundme page below + then register in advance for one of the Flow for Flo classes using the View Classes button. See you in class! If you or your family have medical bills, flooding or have received major damages to your house that insurance will not cover, please know that we have your back! Fill out the brief questionnaire below. With the donations we receive through yoga classes around the country + virtually around the world, we’ll give 100% directly back to the community to those we feel need it most. Calling all yoga teachers, studio owners + businesses who want to get involved! Are you a yoga teacher or studio owner who wants to help out? You’re sweet! Fill out the form below + we’ll get you on our schedule as slots become available. If you’re interested in donating water, food or other basic needs, please visit our friends with We Wilm Rebuild.